On top of the PS63 lifestyle laptop, MSI unveiled its entire line of laptops earlier today at CES 2019 in Las Vegas. The entire line are powered by the by the latest NVIDIA GeForce RTX graphics. MSI GS75 is the company's hero gaming laptop. It features a sandblasted metallic black finish with elegant gold trim. 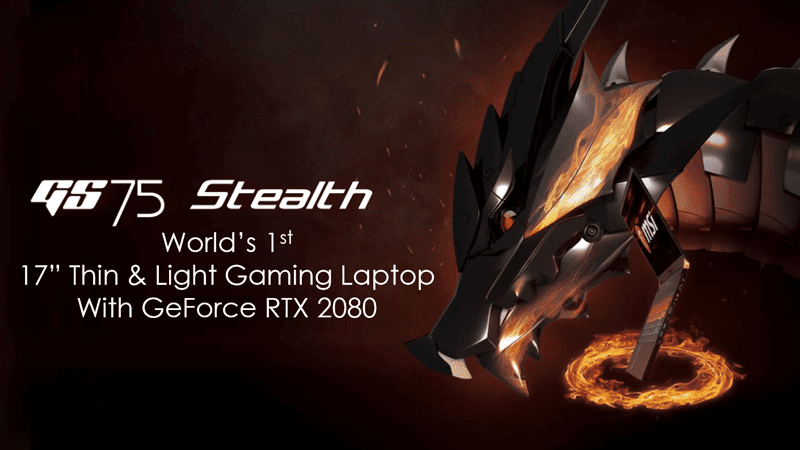 It's the world's first thin and light gaming laptop with GeForce RTX 2080. The GS75 comes with a massive 17.3-inch 144Hz IPS panel with FHD resolution, 4-sided tiny bezels. Inside, it comes with up to 8th Gen Intel Core i7 processor, up to GeForce RTX 2080 8GB GDDR6 with Max-Q design, 1x M.2 SATA SSD, 2x M.2 SSD NVMe PCIe Gen3 SATA SSD combo, SteelSeries RGB gaming keyboard, Sound by Dynaudio, ESS SABRE HiFi audio DAC technology, and Nahimic 3 audio enhancer. It measures at 396.1 x 259.5 x 18.95 mm and weighs at 2.25 kg. MSI stated that it is smaller than traditional 17-inch laptops. 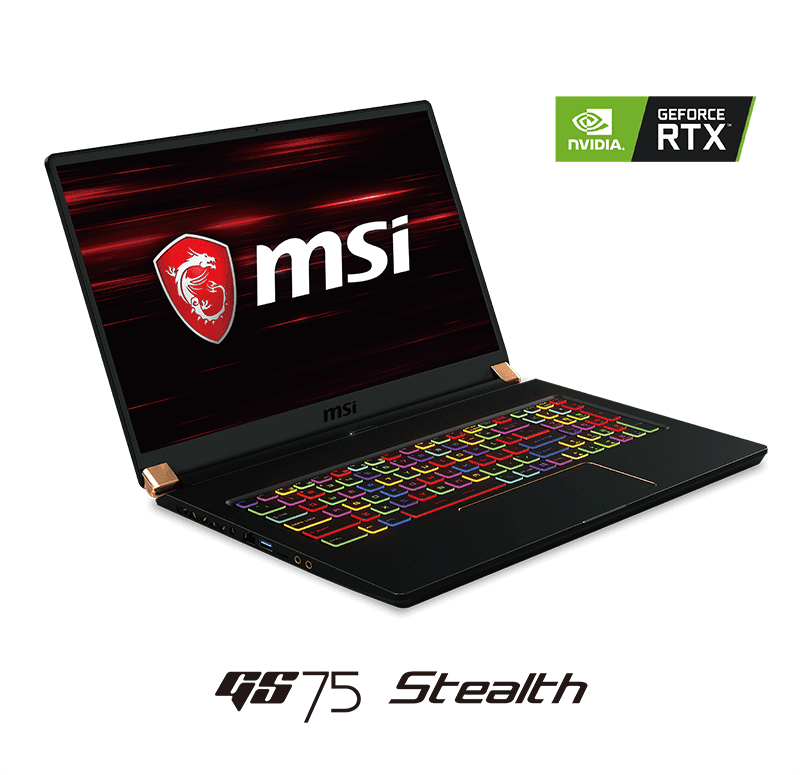 If you are looking for an even slimmer alternative, the MSI released the GS65 Stealth option. It comes with a smaller 15.6-inch 144Hz IPS screen with FHD resolution and thin bezels. Inside, it is powered by the Intel Core 8th Gen i7 processor, GeForce RTX 2070 8GB GDDDR6 with Max-Q design, 1x M.2 SSD NVMe PCIe Gen 3, 1x M.2 SSD NVMe PCIe Gen3 SATA SSD combo, SteelSeries RGB gaming keyboard, Sound by Dynaudio, ESS SABRE HiFi audio DAC technology, and Nahimic 3 audio enhancer. It measures at 357.7 x 247.7 x 17.9 mm and weighs at 1.9 kg. MSI also unleashed the GT75 Titan. It features a monstrous 17.4-inch 4K 3840 x 2160 resolution IPS screen with 100 percent Adobe RGB colors. It also goes with up to 8th Gen Intel Core i7 processor and GeForce RTX 2080 8GB GDDR6 GPU. The laptop also has 1x M.2 SSD NVMe PCIe Gen3 slot, 2x M.2 SSD combo PCIe Gen3 SATA slot, and 1x 2.5-inch SATA HDD. It also goes with a Rapid Mechanical RGB Keyboard by SteelSeries, Sound by Dynaudio with Woofer, ESS SABRE HiFi audio DAC technology, and Nahimic 3 audio enhancer. It measures at 428 x 314 x 58 mm and weighs at 4.56 kg. The MSI GE75 Raider features a unique design with MSI-exclusive Cooler Boost 5 technology. 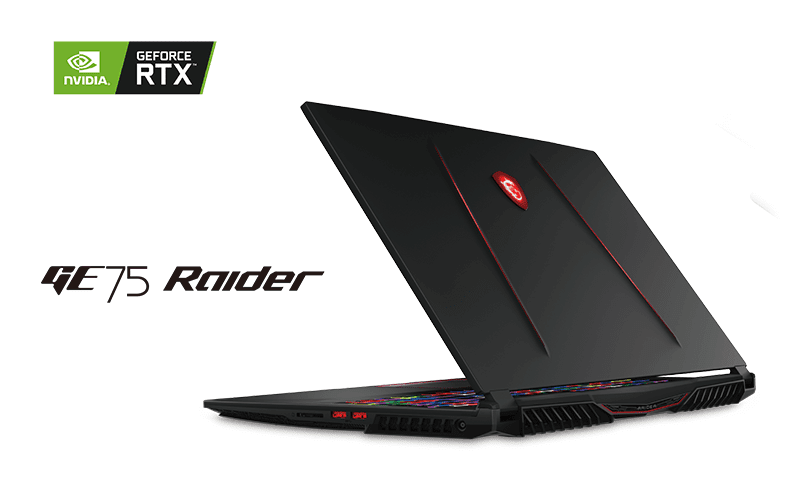 It also has 17.3-inch FHD slim bezel IPS screen, 8th Gen Intel Core i7 processor, GeForce RTX 2070 8GB GDDR6 GPU, 1x M.2 SSD NVMe PCIe Gen 3, 1x M.2 SSD NVMe PCIe Gen 3 SATA SSD combo, and 1x 2.5-inch SATA HDD slot. It comes with a Per-Key RGB gaming keyboard by SteelSeries, Sound by Dynaudio with Giant Speaker, ESS SABRE HiFi audio DAC technology, and Nahimic 3 audio enhancer. It measures at 397 x 268.5 x 27.5 mm and weighs at 2.6 kg. The GL63 is for those who need for a more affordable gaming laptop option without compromising the performance that much. It highlights a 15.6-inch FHD IPS screen with 45 percent NTSC color and anti-glare tech. It comes with up to 8th Gen Intel Core i7 processor, GeForce RTX 2060 6GB GDDR6 GPU, 1x M.2 SSD NVMe PCIe Gen3, 1x M.2 SSD NVMe PCIe Gen3 SATA SSD combo, and 1x 2.5-inch SATA HDD. The laptop also goes with a red backlight gaming keyboard, giant speaker, audio boost technology, and Nahimic 3 audio enhancer. It measures at 383 x 260 x 29.5 mm and weighs at 2.3 kg. MSI also announced that their laptops will also feature the Intel WiFi-6 AX200 (Gig+) technology in the future. There's no word on their official price and date of availability. Stay tuned!